Two weeks ago we released a slew of changes to the test server for our players to play around with. Some changes were buffs, some nerfs; some entirely new content. Our goals were to make the early campaign more interesting for priests and racial skills and to rein in some of the biggest offenders in ranked competitive play. Today we’re updating these changes based on player feedback. The new changes are available to be playtested on our test server immediately. Flaxative will continue rewarding playtesting with pizza, and you can use this guide to access the test server. This card’s usefulness in campaign has been variable according to feedback, leaning toward the positive in the majority of cases. It’s one of the new cards we were most worried about for multiplayer, though: is it too good? Too easy to break, for a modest paper card? The short answer is yes. We just changed Surestrike Blessing to only apply to melee attacks, and would love any feedback we can get on its performance in ranked play. Our first attempt at nerfing Dodge while keeping it cool didn’t work. Its defensive value versus melee decreased too much, far outweighing the neat new interactions it allowed. Now we’re going with a simpler direction: Dodge now triggers on a 5+, but still Moves 1 and has Keep. As a bonus, we’re removing the Encumber restrictions. This is another one we want to see a ton of pressure on. Is it worth running in the current form? The cone was not a successful design. No one liked it and it didn’t meet our goals. We’re reverting Bad Luck to its original form. Bad Luck remains a niche card, and that’s ok.
We worried that allowing all Assists to self-target could lead to some broken interactions. The first and only real problem card we’ve found to date is Martyr Blessing, so we made it so that you can’t target yourself with Martyr Blessing. We’re excited to hear if any other cards have become too good with this change, so be sure to let us know. These cards were changed for vaguer balance reasons than some others—that is, they are too strong individually, but our changes were not a response to pressing format concerns. We always try not to change cards, particularly rares, unless we feel that we have to in order to keep the game format healthy. So, after much deliberation, we’ve reverted these changes. Show us that vampires are too dominant if you feel they are. We’re suspicious that these cards may be too far above the power curve to be good for the game, but we don’t know it yet. Purge lost the ability to self-target in the last test patch. This was a mistake, and it can now self-target again. In addition to all these changes, a ton of bugs associated with the balance patch have been fixed. 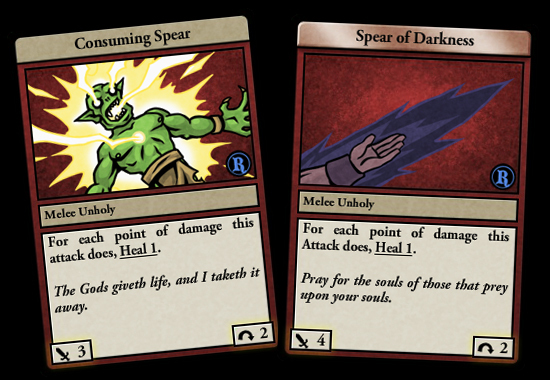 Lateral Thinking should now draw a card properly; movement cards that shouldn’t be blockable are now explicitly unblockable; etc..
We’re hoping to wrap up this package of change as soon as possible, so please help us test the changes in their current incarnation and give us all the feedback you can. Thank you! Great news! It seems all of my previous concerns regarding the changes (dodge, vamp attacks) are fixed. No allowing to self target with martyrs and new elf skills also look nice. Big thanks to staff and All testers! I feel the vampire are not to powerfull. ofcourse it can be irritating, seeing all the life flowing back. But it only works when backup is given , like the mass frezny, or the healing trait. now mass frenzy has changed, the vampires are down also. A spear does 4 damage, and heals 4 (no armor). Which is like netto 8 life. A standard warrior attack. Armor works double downwards – no damage and no life regaining. I am glad the damage is back up. As the vampire would be extint. Now what about whirlwind, should it not be move 3 spaces?